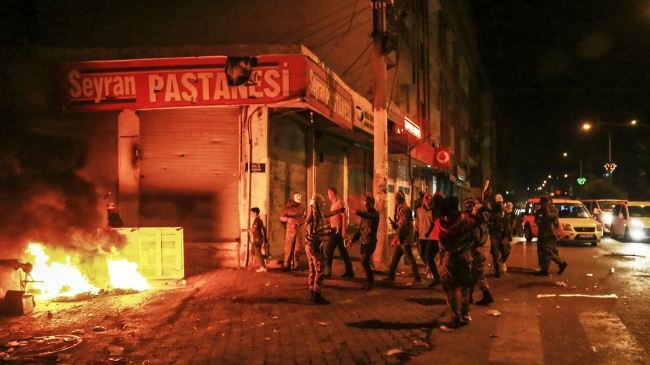 JNN 09 Oct 2014 Istanbul : Turkey’s military on Wednesday imposed a curfew in parts of the southeast after at least 18 people were killed in pro-Kurdish protests over the government’s failure to act against ‘jihadists’ attacking the Syrian border city of Kobani. On Tuesday, thousands of demonstrators took to the streets to voice their anger at what they regard as Turkey’s failure to protect the Syrian Kurdish town of Kobane from the ISIL Takfiri Terrorists. Local media reported that demonstrations were held mainly in Turkey’s predominantly Kurdish eastern and southeastern provinces. Clashes were also reported in the biggest city Istanbul and in the capital Ankara. Police forces fired teargas and used water cannon to disperse the demonstrators. Reports said that clashes between protesters and police claimed five lives in Diyarbakir, the largest Kurdish city in the southeast. A 25-year-old man lost his life in the town of Varto, located in the eastern province of Mus, where at least half a dozen people were also injured in the skirmishes. Several other deaths were also reported in other southeastern towns in Turkey, including three killed in Mardin, two in Siirt, and one in Batman. Meanwhile, Turkish Interior Minister Efkan Ala accused the pro-Kurdish demonstrators of “betraying their own country” and said they would face “unpredictable” consequences, if they do not disperse. “Violence will be met with violence… This irrational attitude should immediately be abandoned and (the protesters) should withdraw from the streets,” Ala added. The protests come as ISIL terrorists have advanced into the southwest of Kobane and its surroundings that have been under attack since mid-September, with the militants capturing dozens of nearby Kurdish villages. The intense fighting for the town has forced nearly 200,000 people to take refuge in Turkey. Many Turkish Kurds are furious at the inaction of Prime Minister Ahmet Davutoglu’s government with regard to the plight of Kurds in Kobane. They are also angry that Turkey has so far failed to launch a military intervention against the ISIL Takfiris despite having parliamentary authorization. The urban warfare between Kurdish forces and the ISIL Takfiri terrorists rages on in Syria’s border town of Kobani. According to latest reports on Wednesday, the Kurdish fighters have managed to compel the ISIL militants pushing them back from some neighborhoods in the strategic town. The Takfiri terrorists, however, have been advancing into the southwest of Kobani and its surroundings that have been under ISIL attack since mid-September. Several explosions were also heard in the border town. On Tuesday, US-led coalition airstrikes hit ISIL positions in the center and southwest of the key town amid criticism that the airstrikes are not actually targeting militant positions. The US-led coalition airstrikes are “helping but are not enough,” said Idris Nahsen, a Kurdish official in Kobane. “We need help from the international community. Either we finish them or they will finish us,” he added. The Takfiri Terrorists have already seized control of three districts in Kobani and the fighting has spilled over into new areas in the south and the west of the town. The head of the Kobani Governing Council says that US-led campaign is fruitless because it has failed to prevent ISIL militants from advancing toward the town. The ISIL militants have taken over dozens of Kurdish villages in the vicinity of Kobani. A UK-based Syrian opposition group says over 400 people have been killed in the three weeks of battle around Kobani. The fatalities include 220 ISIL terrorists, 170 Kurdish fighters and over 20 civilians. The intense fighting for the strategic town has forced nearly 200,000 people to take refuge in Turkey. This entry was posted in Europe, Middle East and tagged ISIL Takfiri Terrorists, Kobane, Kobani, Syrian border city, Syrian Kurds, Turkey, Turkish Kurds. Bookmark the permalink.